A Thing for Roses: Happy Mother's Day! Just want to wish all the blog Moms a very happy Mother's Day. Isabel, Kate and I had a fabulous day yesterday out at Barn House. Unfortunately I didn't take any pictures, but there were cameras everywhere. You can see some of Isabels pictures of the event here. I found a few neat things to buy, but this was my first, favorite and least expensive find of the day. 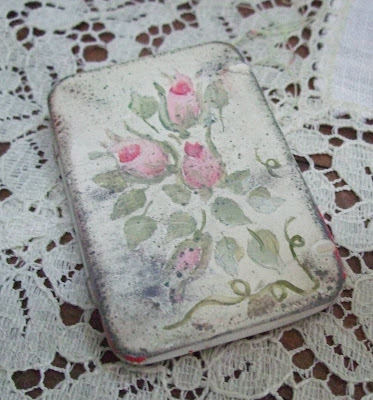 A sweet vintage medicine tin that someone lovingly painted with sweet rose buds and vines. In other news, I just found out this morning that I've been selected "Mother of the Year!" You can see the news clip here. And finally, I want to wish a very special happy Mother's Day to my awesome Mom, Judy! Congrats on your award!! I want a Fan Club too!! :o) And thanks for coming up to visit with us on Saturday...We absolute LOVE our gift. Thanks you sooooo much!! I'm out blog strolling and came into your neck of the woods. I'm so disappointed I missed the big weekend in Battleground recently. I didn't even realize these kinds of sales were out there. I live in Centralia, halfway between Portland and Seattle, so a trip there is a possibility! My Mom are planning to come down on the July date, so maybe we'll see you there! We had a wonderful time, with old & new friends & I look so forward to the flea market, when we all can gather again! Just wanted to tell you that I enjoyed meeting you at the Barn House event, and I'm looking forward to seeing what you bring to the Farm Chicks show! Love the baby on the video! And that little medicine box is pretty cute, too!